I’m probably the last person who should be reviewing this book because quite a bit of it is about mathematical puzzles, and I’m hopeless with these. I enjoy them as long as I can get the answer off the top of my head within 30 seconds – then I feel smug. But otherwise I get bored, and I’m certainly not going to do anything that involves writing out a series of equations. That’s perhaps a bit picky, though. Because the book has a much wider brief than mathematical puzzles and diversions – it provides us with many excerpts from maths books aimed at the general reader over the last five hundred years. As such it’s a box of curiosities. Reading it is a bit like going around one of those really old fashioned, fusty local museums. A lot of the stuff you see you think ‘Why are they bothering to display this?’ But then you will come across a little gem like a mummified mermaid and it is all, briefly, worthwhile. So it is, for example, quaintly interesting to see extracts from Robert Recorde’s famous sixteenth century mathematical textbooks, giving us instructions in how to add two numbers together, or to dally with the mathematical problems set in The Girls’ Own Book(even if I had to read the answer to one several times to understand what it was getting at). But there was a lot that wasn’t particularly thrilling. 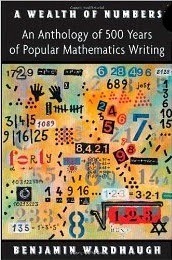 I may be biassed but I think I got more from some of the science writing that somehow creeps in (who couldn’t enjoy A Mother Explains Comets from 1823 or the incomparable Richard Feynman on The Character of Physical Law) but I can see for the enthusiast for the history of popular maths writing this is a must-have book. I just suspect that this is a relatively limited market. For the rest of us, it would liven up a wet weekend in Margate, but would be trumped by most other entertainment.